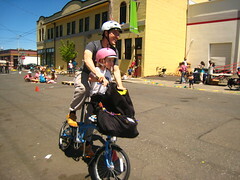 Save the date for the Seattle version of Fiets of Parenthood: Sunday, August 15th from 3:00 to 6:00 PM. We had such a great time at FoP in Portland, we can’t wait to do it all over again in Seattle. Location and all the other juicy details will follow in the weeks ahead. Stay tuned, mark your calendar and plan on a super fantastic afternoon of family bike fun. This entry was posted in bikes, Events, extravehicular activities, family cycling and tagged bike events, Family Cycling, fiets of parenthood, fun, seattle, summer. Bookmark the permalink.